In my previous post I told you all about the new Tag Get Ready for Kindergarten interactive book. We had a blast with that one. Check out that post HERE. Today I am excited to tell you about the Tag Interactive Human Body Discovery Pack. The pack comes with a two-sided interactive chart and game board, an interactive growth chart, and interactive glow-in-the-dark stickers. Yes, I did just say interactive glow-in-the-dark stickers. You have my permission to "eek". The book unfolds into a chart that shows each of the body's systems such as the skeletal, nervous, and digestive systems. There is also a game board with a Making Healthy Choices game. On the other side is a large chart of the inside of the human body. It includes facts, tips for staying healthy, and a game to show what you have learned. My children know that I have a bad gallbladder so we used the chart to show them where it is and what it is supposed to do, and explained that mommy's doesn't work very well. On the same side of the chart is a section that teaches how we are all different, and in some ways the same. I really liked this because addressing why we all look different can sometimes be a delicate subject, especially with smaller children, but the Tag Human Body chart puts it into such easy and clear terms. For example when you hold the tag to a picture of one of the children it says "Melanin is a brownish color found in the skin. I have more melanin than Chris so I have darker skin." 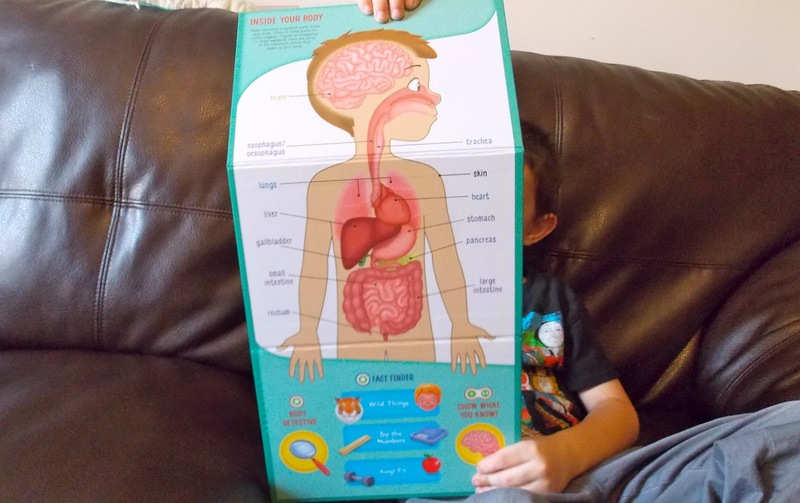 Like I mentioned earlier, the Tag Human Body Discovery Pack also comes with a growth chart and interactive stickers. We hung it on the wall of the kids' room and took turns measuring each child. The growth chart included milestone stickers to place next to each child's height. After we were all measured Dax had fun placing the stickers in the correct places on the chart and using the tag to identify the parts of the body. I know this information stuck because he bumped his head a little later in the day and said, "Mommy! I bonked my cranium!" 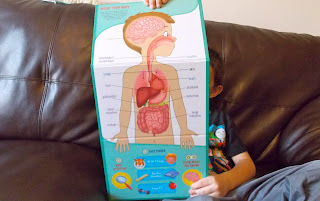 Dax and his siblings really loved playing with the Human Body Discovery Pack. It is always nice to see your children so engaged in something educational. My only complaint was that the kids fought over who got to play so I may have to go buy another Tag pen to keep the peace. For more information on the Tag Human Body Discovery Pack check out the LeapFrog website. My small boy is very interested to know new things. That's why I teach him several things those are very important for human being. I love these tips for staying healthy, and a game to show what you have taught. Thanks for sharing this informative article.